A brief review of 2018. 2019 lithium themes to consider. Some further reading and risks discussed. This article first appeared on Trend Investing on January 8, 2019; therefore all data is as of that date. As we head into 2019, some key themes for the lithium miners will be a further move towards lithium hydroxide, vertical integration, takeovers/mergers and acquisitions, the inevitable lithium demand versus supply debate, and a likely recovery of the quality lithium miners. We may also see more dramas from Chile or the DRC, and miners and investors reassess sovereign risk. 2018 was marked by unfounded lithium oversupply fears, drama in the Atacama, China's overinflated lithium spot prices and lithium carbonate prices falling, five new lithium producers entering the market, analysts increasing their lithium demand forecasts as electric vehicle (EV) sales surged, and sentiment going from bad to worse. Unfortunately, for investors, 2018 left many lithium stocks down 50% or more and many abandoning the market. 2019 should be a recovery year, given the very cheap valuations that have now returned. Continuing on from 2018, I am expecting a continued shift of focus towards lithium hydroxide production. The lithium hydroxide market is estimated to grow very rapidly due to the demand for lithium hydroxide for most new EV batteries. Lithium hydroxide is preferred over lithium carbonate, as it allows greater battery capacity and longer battery life. Forecasts vary but are generally in the range of increasing from 65-75ktpa in 2018 to 500ktpa by 2025, which would be about a seven-fold increase in the next seven years. For Benchmark Mineral Intelligence, the lithium-ion battery industry is planning for a huge NCM (nickel-cobalt-manganese) cathode ramp-up. 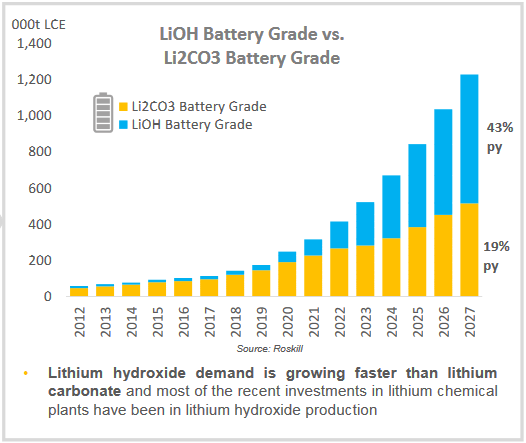 In fact, the shift towards lithium hydroxide-intensive cathodes is underway, with the London-based firm expecting that about 44 percent of megafactory cathodes will need it as a raw material by 2028 - which translates to approximately 534,000 tonnes. A growing trend is for the lithium miners to get involved with a larger part of the lithium supply chain ("vertical integration"). 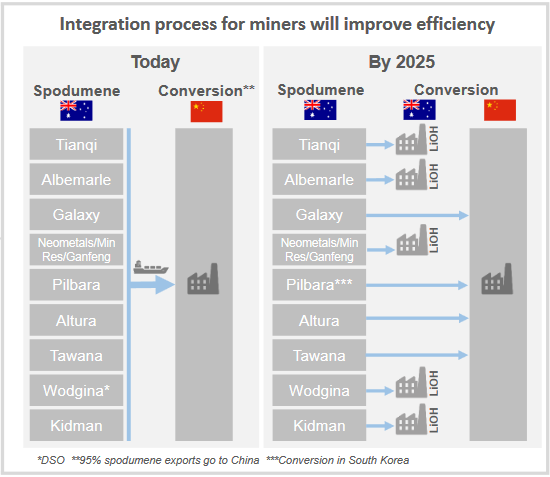 The main example going on recently is for various spodumene producers and near-term producers building or planning lithium hydroxide conversion plants. 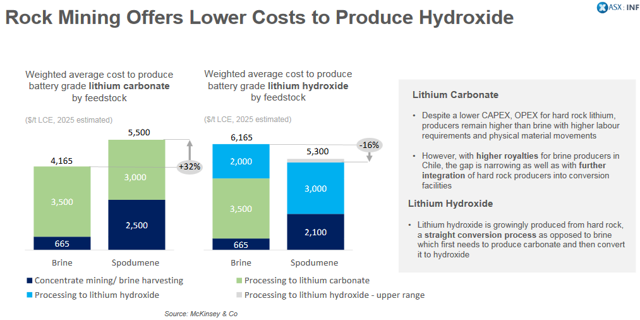 The lithium miners will act to take a larger part of the value chain and also decrease their overall cost to produce the lithium hydroxide needed for EV batteries. My list and the chart below give a great guide as to the key players so far. Notice that Western Australia dominates for now, but this could expand to other regions such as the Northern Territory of Australia, or James Bay Canada. I think the strategy makes good sense, and therefore the names below should also appeal to investors. 2020 - Shawinigan near Montreal Canada (23ktpa) - Nemaska Lithium (OTCQX:NMKEF). 2021 - Kalgoorlie WA (initially 10ktpa) - Neometals (OTCPK:RDRUY) [ASX:NMT]/? - Feasibility stage, may start by 2021. 2021 or after - Kwinana WA (45ktpa) - SQM (NYSE:SQM)/Kidman Resources (OTCPK:KDDRF). 2021 or after - Near Bunbury WA (5 x 20ktpa stages) - Albemarle (NYSE:ALB)/Mineral Resources (OTCPK:MALRY) [ASX:MIN]. Note: Neometals is in the process of selling out of Mt Marion to the other two partners. In 2019, I expect to see a lot more takeovers, mergers, and acquisitions of promising lithium juniors or small lithium producers due to the enormous valuation opportunity that has now presented after the 2018 EV metal miners' rout. Two examples from December give an idea of what is ahead. December 14, 2018 - Albemarle agrees to acquire a 50% interest in Mineral Resources' Wodgina hard rock lithium project in Western Australia for US$1.15b, and form a joint venture with MRL to own and operate the Wodgina Project to produce spodumene concentrate and battery grade lithium hydroxide. December 21, 2018 - Neometals agrees the sale of Mt Marion equity for $A104 million and retains offtake rights. Neometals to sell its Mt Marion project equity to Ganfeng and Mineral Resources for ~A$104 million. As for specific names or deals, I can only throw in a few ideas. To begin with, I see some consolidation likely in the Argentina lithium juniors (many names so many options). Galaxy Resources (OTCPK:GALXF) may partner at Sal De Vida (POSCO (OTCPK:PKXFF)?). Perhaps a cheap Australian spodumene producer or junior (Altura Mining (OTCPK:ALTAF) [ASX:AJM], Core Lithium (OTCQB:CORX) [ASX:CXO], Sayona Mining (OTCPK:DMNXF) [ASX:SYA], or Hannans (OTC:HHNNF) [ASX:HNR]) may be bought out or merged? If history is any guide, then the big lithium producers (Albemarle, SQM, and the Chinese Ganfeng Lithium [SHE:002460] [HK:1772], and Tianqi Lithium Industries Inc. [SHE:002466]) will be the likely suitors. Or thinking further ahead perhaps 2019 will be the year the big diversified miners (BHP Group (BHP), Rio Tinto (RIO), or Vale (VALE)), or some oil majors (Shell (NYSE:RDS.A) (NYSE:RDS.B), Chevron (NYSE:CVX), BP (BP), Eni (NYSE:E), Total (NYSE:TOT), Sinopec (NYSE:SHI), Exxon Mobil (NYSE:XOM)) or the Saudis make a big move into lithium. Certainly if the latter happens, it could be a huge catalyst for the sector. Provided electric vehicles sales continue to grow strongly each year, which seems increasingly likely (read "The EV Boom Just Keeps Getting Bigger - Update End 2018"), then lithium demand should also increase rapidly. My model is forecasting a 4.5-fold increase in lithium demand from end 2018 to 2025. Note: Lithium demand assumes from 2020 the average electric car has an average 50kWh battery with 45kg of lithium carbonate equivalent (LCE), and my model also allows for lithium demand from e-buses, e-bikes, e-trucks, e-ships, e-planes, energy storage, and conventional lithium demand areas (electronics, ceramics, glass, etc.). Confirming the demand wave coming is the Benchmark Minerals Megafactory update: Currently tracking 66 plants on the @benchmarkmin tracker, rapidly approaching 1.4TWh capacity by 2028. Lithium supply traditionally struggles to match forecasts due to the difficulty of bringing on new lithium supply. 2018 saw five new lithium miners commence production. They were Alliance Mineral Assets Limited ("AMAL")/Tawana Resources (OTCPK:TWNAF) [ASX:A40], Altura Mining, Pilbara Minerals [ASX:PLS] (OTCPK:PILBF) [ASX:AJM], AMG Advanced Metallurgical Group NV [NA:AMG] [GR:ADG] (OTCPK:AMVMF), and North American Lithium (private, CATL is a part owner). In contrast, 2019 may see no new lithium miners enter the market as producers, just a ramp-up from existing miners, and some small Direct Shipping Ore (DSO) operations. Nemaska Lithium has guided to commence spodumene production by Q3 2019 and hydroxide by Q3 2020, so it may end up being the only new producer in 2019 if it runs on schedule. My model forecasts some possible mild oversupply in 2019 (mostly in spodumene that may hurt spodumene prices), with risk of under-supply building beyond 2020 due to rapid EV uptake and lithium demand surprising to the upside. Without question the negative sentiment of 2018 has left investors battered and bruised with the lithium miners now back to very cheap valuations after heavy price falls. "I've never seen a bigger disconnect than I have currently seen right now in the lithium market just with respect to the demand side of this equation," said Berry, adding that he hasn't seen any data or any evidence that the demand narrative is slowing down or reversing. "My sense right now is that when we look back at 2018, it'll be a year where valuations reset because there are some enormously cheap opportunities in the space right now based on all of the blood that's been on the streets." Provided China and EV growth remain strong in 2019, I expect to see a strong recovery in the "quality" lithium miners. By that, I mean the lithium producers and funded near-term lithium producers (such as Lithium Americas [TSX:LAC] (NYSE:LAC), and Nemaska Lithium). A few other quality juniors (such as Neo Lithium [TSXV:NLC] (OTCQX:NTTHF), Core Lithium Ltd. [ASX:CXO] [GR:7CX] (OTCPK:CXOXF), Kidman Resources [ASX:KDR] [GR:6KR] (OTCPK:KDDRF), AVZ Minerals [ASX:AVZ] (OTC:AZZVF), etc.) and perhaps a few lithium clay projects (Cypress Development Corp. [TSXV:CYP] (OTCQB:CYDVF), Ioneer Ltd. (OTCPK:GSCCF) [ASX:INR]), or solid brine (Plateau Energy Metals [TSXV:PLU] [GR:QG1A] (OTCQB:PLUUF)) that can make good progress in 2019 will also do well. Many other juniors have a chance to make it, but they must advance and secure funding in this difficult environment. 2019 will most likely see a few struggling lithium juniors disappear. Lithium prices falling. For now, lithium supply is just managing to keep up with the surging demand; note that electric vehicles grew ~70% pa in 2018. Some excess spodumene supply in 2019 may hurt spodumene prices. Mining risks - Exploration risks, funding risks, permitting risks, production risks, and project delays. Sovereign risks - Chile is a bit concerning right now (both Albemarle and SQM have had dramas in the Atacama in 2018). Argentina seems better for now. Australia and Canada are low risk. Stock market risks - Dilution, lack of liquidity (best to buy on local exchange), market sentiment (the trade war has negatively impacted most if not all metal markets in 2018). Due to the poor sentiment, lithium juniors may have difficulty raising capital. After a terrible 2018 for the lithium miners, the sector is full of great buying opportunities. All analysts agree there is a massive disconnect between lithium miner prices and the fundamentals pointing to surging demand and strong lithium prices. Not unexpectedly some forecast lithium supply did not materialize, and some countries such as Chile proved difficult to navigate for the lithium giants. My view is that in 2019 we will see most if not all of the five themes play out. The five are a further move towards lithium hydroxide production, vertical integration, takeovers/mergers and acquisitions, lithium demand to remain strong but met by new supply (mild spodumene surplus in 2019), and quality lithium miners to recover. We may also see some flight to safer jurisdictions. A final comment is that for the lithium miners to recover, we probably need an improved macroeconomic environment, and in particular, the US-China trade war to be resolved, and China's economy to remain strong. We also need electric vehicle sales to continue growing near or above 50% pa, which for now seems highly likely. Disclosure: I am/we are long NYSE:ALB, GANFENG LITHIUM [SHE: 2460], NYSE:SQM, ASX:ORE, ASX:GXY, ASX:PLS, ASX:AJM, TSX:LAC, TSXV:NLC, ASX:AVZ, ASX:NMT, TSXV:AIS, ASX:CXO, TSXV:PLU, TSXV:CYP. I wrote this article myself, and it expresses my own opinions. I am not receiving compensation for it (other than from Seeking Alpha). I have no business relationship with any company whose stock is mentioned in this article. Additional disclosure: The information in this article is general in nature and should not be relied upon as personal financial advice.